As we look forward to all that 2013 has in store, we also look back fondly on all that we have accomplished in 2012. So as we dive right into the new year, here are our “Top 10” most viewed blog posts from 2012. Using aerial survey images from the US Dept. of Agriculture’s (USDA) National Agricultural Imaging Program (NAIP), we looked at the way new wells and infrastructure are changing the landscape in rural southwestern Pennsylvania. Using aerial images to track development of natural resources and compare with information from state and industry sources is at the very core of what we do here at SkyTruth. 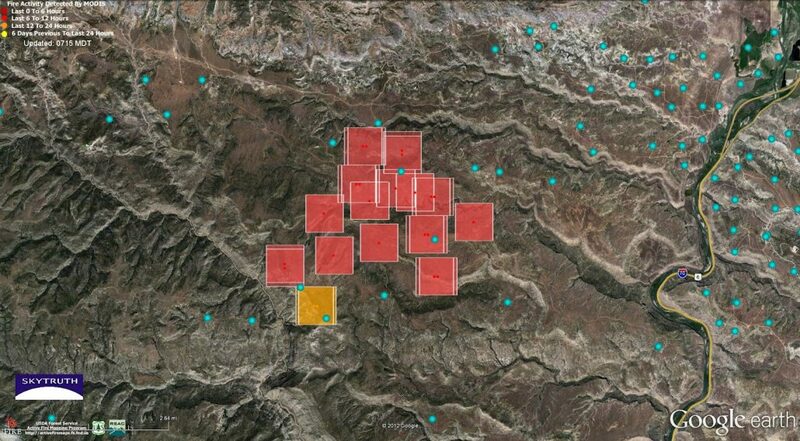 As wildfire season kicked off in the Western US, we were particularly interested in the proximity of gas wells to active wildfires. While natural gas infrastructure is notoriously leaky, the Grand Junction Sentinel reported that gas operators in the Pine Ridge area shut in their wells as the fire approached so as not to risk adding to the blaze. In order to coordinate relief efforts and assess damages, the National Oceanic and Atmospheric Administration (NOAA) coordinates aerial image surveys after natural disasters like Hurricane Sandy. These images are made available to the public as soon as they are processed, and we compiled a few sets of images that illustrated the sheer power of the storm. While the twisted, submerged wreckage of a roller coaster hints at the power of the storm, nothing quite tells the story like seeing the complete rearrangement of the landscape from our perspective in the sky. A blowout at an off-shore rig drilling for natural gas in the Elgin field (located in the North Sea between Scotland and Norway) garnered some attention in March. The leak turned out to be on the rig itself, not underwater, but we observed some kind of spill on the surface around the rig. The spill is most likely gas condensate, a signifiant byproduct of drilling in that region of the North Sea. Our next most popular post was not documenting a spill, but was about a fictitious Pennsylvania family. 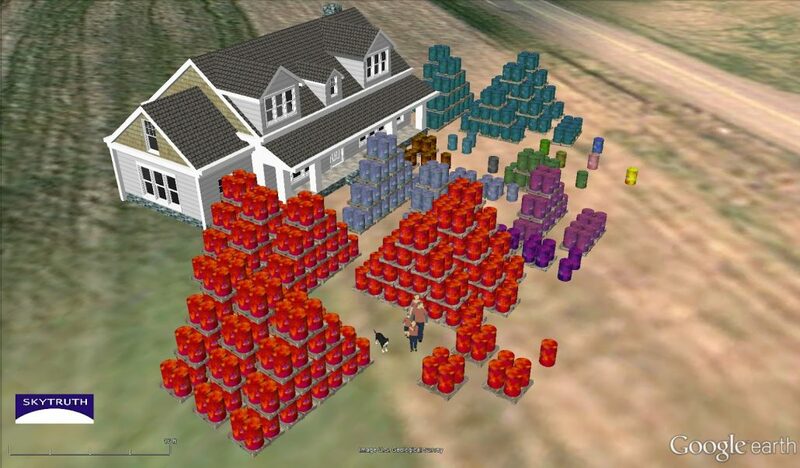 Based on data from a voluntary industry report about the chemicals used in a typical hydraulic fracturing job in the Marcellus Shale, we created a 3D visualization of volume of various chemicals used in the process. We also pointed out the substantial number of chemicals which industry claims are “trade secrets” and were not identified at all – symbolized by the large quantity of red barrels. 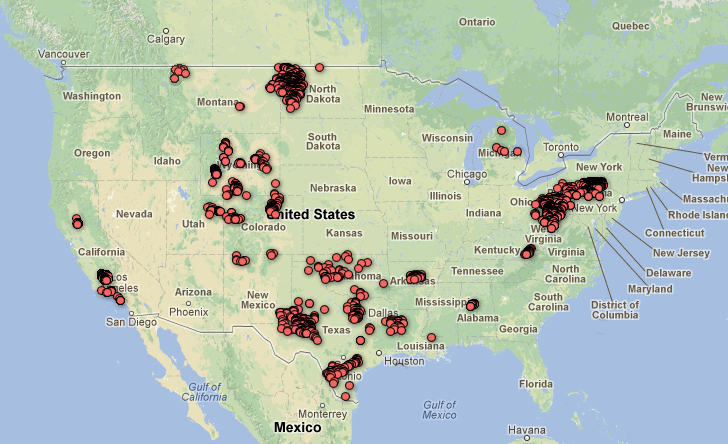 #5: Water, Water, Everywhere: 20 Months of Frackwater in the U.S. Following up on our work with voluntary industry reports on the chemicals used in hydraulic fracturing, we compiled all of the data voluntarily reported to the industry-funded disclosure website FracFocus.org. 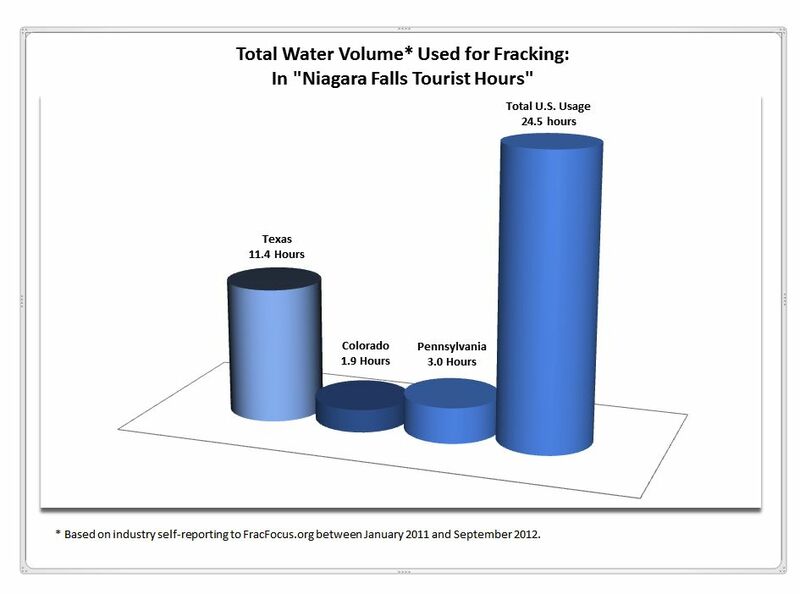 Adding up the millions of gallons of water, we found that it would take over 24 hours for all of the water reportedly used for hydraulic fracturing to flow over one of North America’s Seven Natural wonders: Niagara Falls. This was also reposted to our partners at EcoWatch.org, where we used this calculation to represent Central Park covered by 240 feet of toxic waste-water. 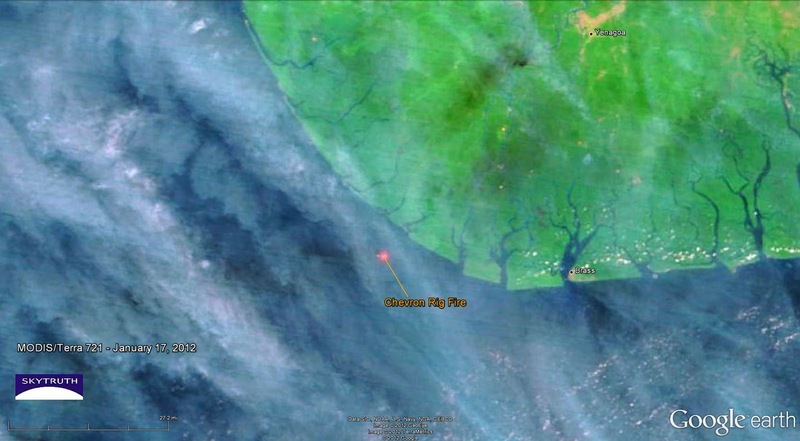 A blowout off the coast of Nigeria got some major attention, but thankfully the natural gas well did not produce as large a spill as was possible. 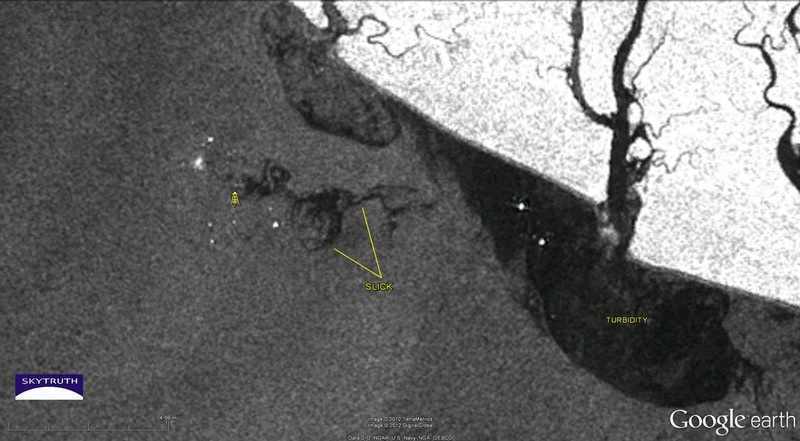 We noted the heat of the burning rig on infrared composite images, but radar satellite images showed only a small slick. 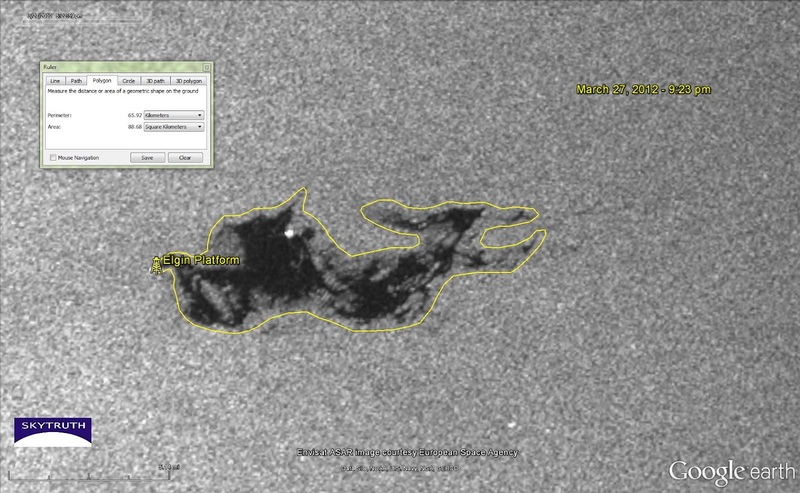 Not all of the data we use is available to the general public for free, but some images, such as this infrared composite, are freely available from NASA for anyone to look at. We heavily promoted the release of our fracking chemical database to the national media and to our partners. This resource will greatly aid policy discussion about disclosure regulations and aid in research on the impacts of hydraulic fracturing across a wide-range of disciplines. While the database is most useful to researchers and decision makers, this database enables everyone to sign up for SkyTruth Alerts whenever new fracking chemical reports are uploaded to FracFocus.org. Our most popular posts are usually related to pollution incidents, and the rig fire off the coast of Nigeria in January was no exception. While our report on the 20th of January (#4 on this list) had more detailed analysis of the incident, this preliminary post gained over 500 more views. 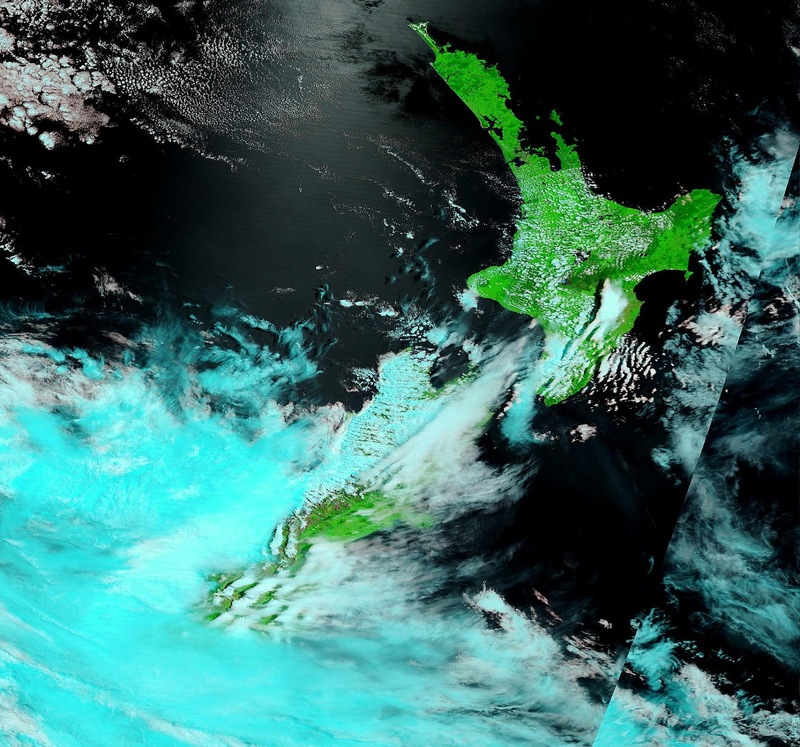 Not only do we have the capacity for detailed tracking of environmental incidents, rapid access to satellite images allows us to respond quickly to breaking news. Unfortunately, one of our best resources, the European Space Agency’s Envisat, unexpectedly went silent in April. We are looking forward to the launch of its replacement, Sentinel 1, sometime this coming year. 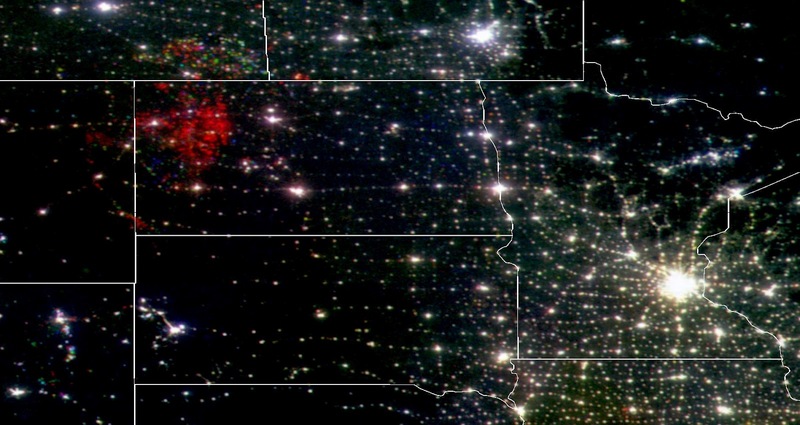 Our most viewed post of 2012 was nightime imagery of natural gas flaring in North Dakota’s Bakken Oil Shale. Because the main focus of drilling in the Bakken is for highly profitable oil, most of the natural gas that’s also being produced is flared off (burned) as a waste product. Much better options are to inject it back into the reservoir, or capture it for sale. After all, why are we drilling and fracking for natural gas in the Rockies and the mid-Atlantic, while we’re just wasting it in North Dakota? Expect to see more from us on the issue of flaring in 2013 as we work with a new dataset of nighttime light detection from NASA. In 2013, SkyTruth will continue to provide up-to-date information on pollution incidents and reveal the truth about the environmental impact of large-footprint industrial activities such as mining, drilling, commercial fishing, etc. In all of this, we work to support scientifically credible research and policy decisions that will help us understand and manage our planet’s natural resources in the best way possible. Arctic Drilling: Not Ready for Prime Time What’s Going On at the BP / Deepwater Horizon Spill Site?